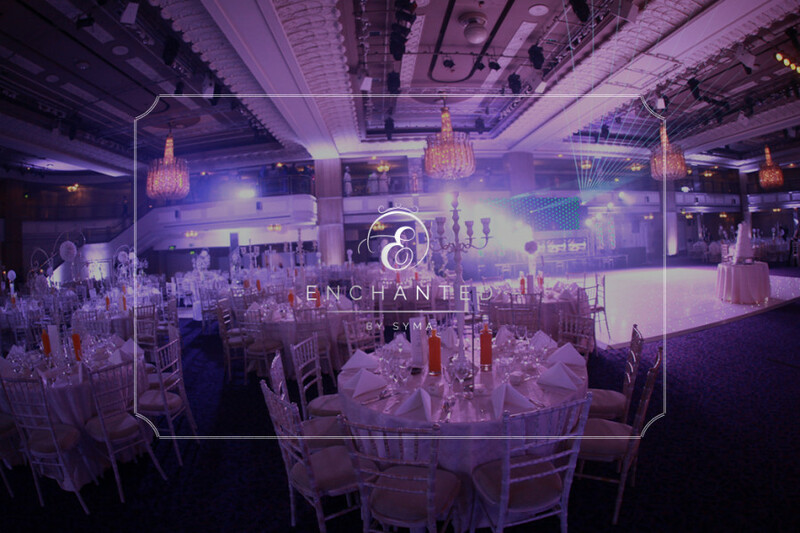 Indeed this was the start of Enchanted and our very own founder and director of Enchanted’s, lavish wedding, at the leading venue Grosvenor House, Great room. This spectacular room is well known for its size and lavish chandeliers scattered around the room, which creates a stunning ambiance. 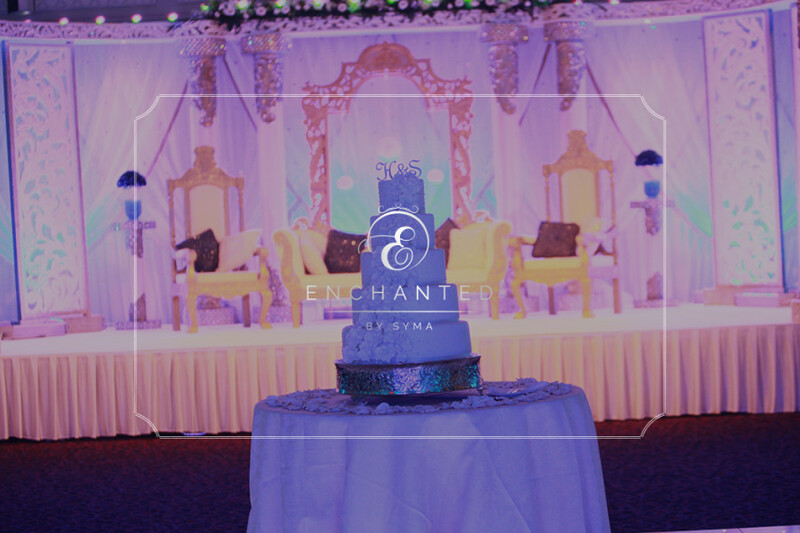 With 700 guests this was the perfect wedding for our bride Syma and Groom Haroun’s fairy tale wedding. Being a wedding of both couple, coming from a background in events, there were no bounds left to make this as magical as they had imagined. 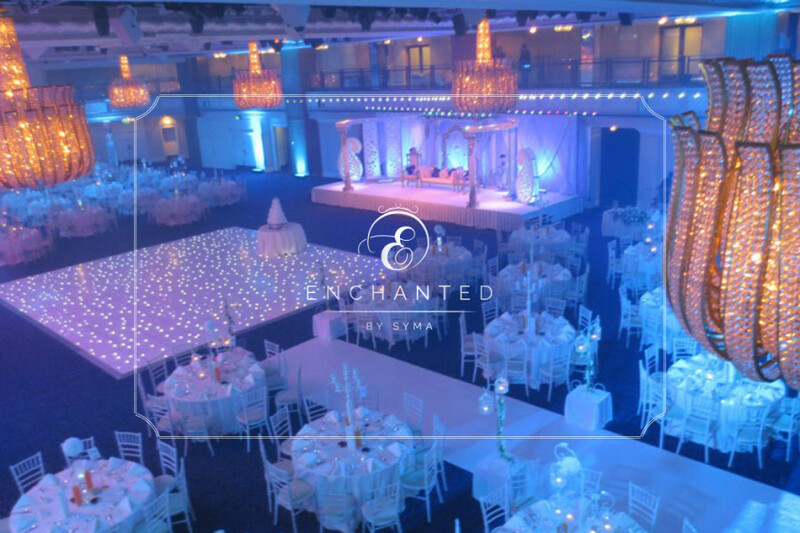 The room was transformed into an enchanted white forest with trees, birdcages and flower balls all designed by Syma Ahmad Raja. The supplier’s part of this event, are leading suppliers within their industry. There was a beautiful center stage area which looked nothing less than fabulous also designed by Syma but put together by Wed in style leading company in supplying mandaps. 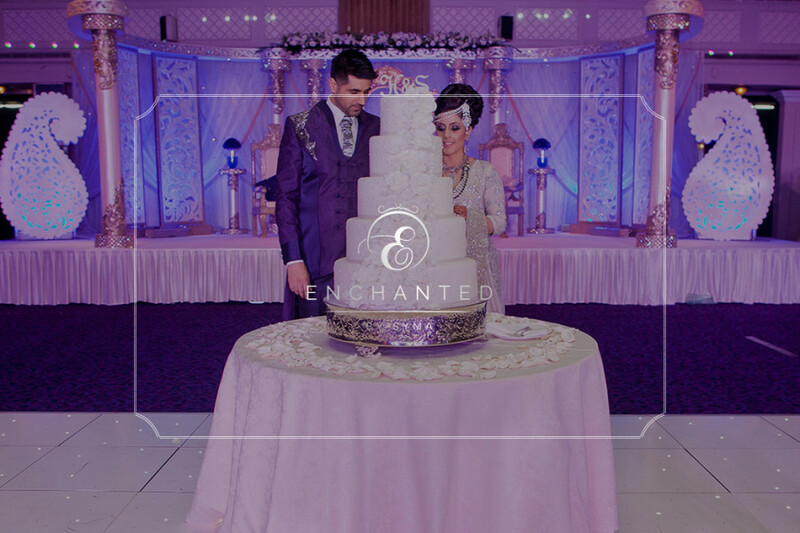 There was a huge dance floor which was supplied by Sunny Arora from Spectrum events, an impressive DJ setup by Chintz Garcha from Showcase Entertainment and the most elegant cake created by Sweet Hollywood. The evening was captured by Pratik from Unia Productions and photography by Aki and Reshma. Symas outfit was designed by Pakistan leading fashion designer Sana Safinaz, hair and makeup was done by none other than amazing Lubna Rafiq. Harouns outfit was designed by the very talented Saran Kohli from Khoobsurat. 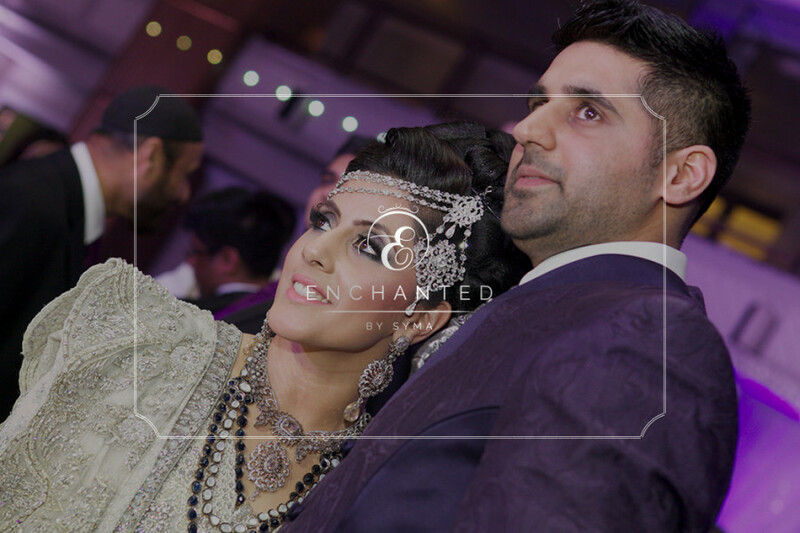 All the look from the venue to our bride and grooms look were all incorporated within the theme of their wedding. 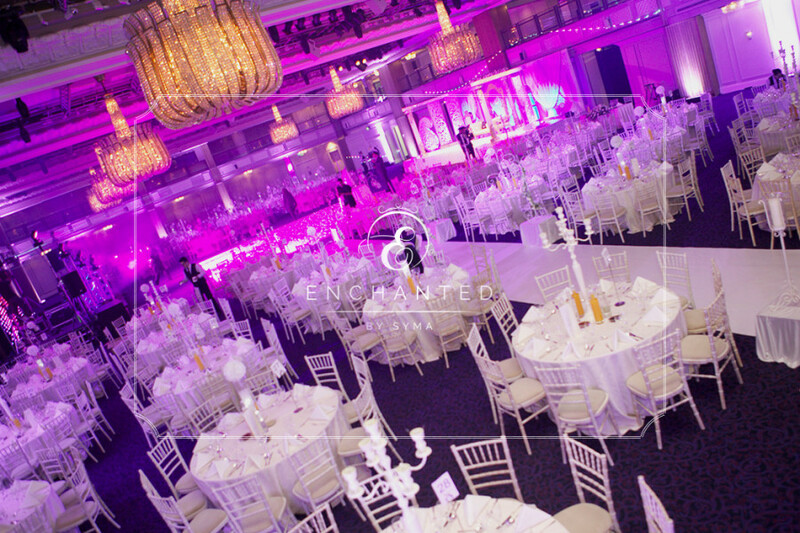 The evening was introduced by a dance performance by Nach de Punjab dancers, followed by an entertaining entrance from the bride and groom who made their entrance down either side of the Great Room staircase to Rahat ali “Dil Mera.” They then graced the dance floor to cut their gorgeous cake 5 tier white wedding cake, which was designed by leading cake suppliers Renu & Pardeep from Sweet Hollywood. 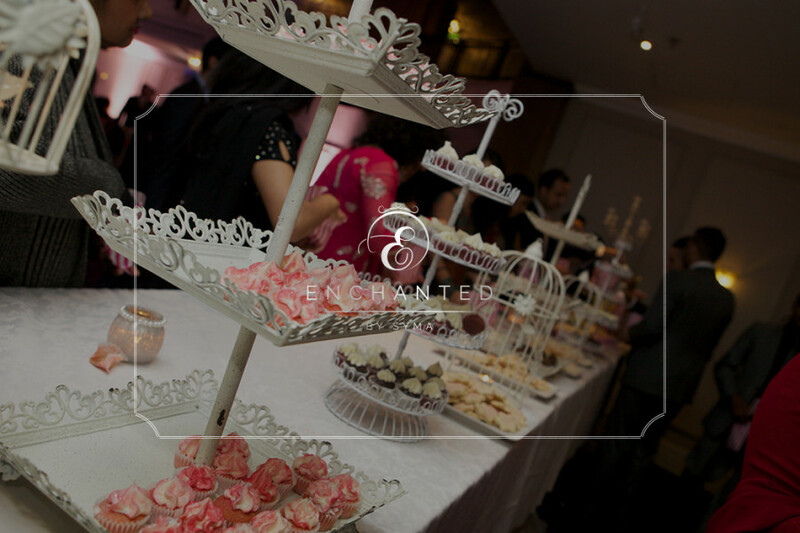 A stunning 3 course meal served by Sapna and to end the night was a tasty candy buffet which was a perfect touch to the perfect wedding.